Walter Mason's Destination Saigon - Ok, ok, so I wrote it. But honestly, if you want an intimate view of contemporary Vietnamese religion, culture and sexual mores, and a bit of a giggle, then this is where you should start. So many books about Vietnam are about the war or about colonial history. I set about writing a book that was telling stories of Vietnam now, and I really think I succeeded! Andrew X Pham's Catfish and Mandala - Quite a superbly written book that is about so much more than Vietnam, this is a unique and compulsive read that offers a great deal of insight into what it's like to be an overseas Vietnamese returning home as a stranger. Books about Vietnam are normally told from the perspective of a foreigner, or are translated works by people living in Vietnam. Gontran de Poncins' From a Chinese City - A French Count goes to spend a few months in Cholon, Saigon's Chinatown, in the 1950s. This is such a gorgeous book, and absolutely fascinating. There are very few books on Vietnam that deal with the Chinese community in any detail, so this is a real rarity. Norman Lewis' A Dragon Apparent - More Indochina in the 50s, Lewis' quiet British fortitude makes him an excellent observer, and his love of the Vietnamese comes seeping through. Vietnam travel books are surprisingly rare, and really good ones rarer still. Lewis' is the best. Graham Greene's The Quiet American - Yeah, yeah, I know it's on every list, but really it is quite perfect, and you can still visit most of the places he mentions in the book. If you're going to Vietnam, do make sure you read this book first. Marguerite Duras' The Lover - Especially if you are planning on having an affair with a Vietnamese guy (though the lover is actually Chinese). Sensuous, historically fascinating and quite dazzlingly accurate. Not really full of Vietnam tips, but it creates the most wonderful mood and evokes an incredible era that is only now beginning to be romanticised and even celebrated in Vietnam. Thich Nhat Hanh's Zen Keys - A unique insight into Vietnamese Buddhist monasticism. As well as information about the philosophy of Buddhism, it provides a great story to read about the life of a young monk, and how they were once expected to behave inside the Chua (Pagoda). Kien Nguyen's The Unwanted - Absolutely the best account of what Vietnam was like in the years immediately following the end of the war. This book is a masterpiece and deserves to be better known. Don't wait to buy this one - it is one of the really good Vietnam books, and one of the most unique perspectives. Duy Long Nguyen's The Dragon's Journey - A memoir about a Vietnamese refugee's journey to Australia, where he becomes a famous healer. A book about Vietnam and about the journey of the Vietnamese dispora. Stanley Karnow's Vietnam: A History - Pretty solid going, but once you've finished it you will be entirely informed about the complex and long-lasting Vietnam war. Ma Van Khang's Against the Flood - A little-known but fascinating fictional peek into the ghastly bureaucracy and stifling conservatism of Vietnamese life in the 80s and 90s. "The Lotus Eaters", by Tatjana Soli is a great read too, as is "The Sacred Willow" by Duong Van Mai Elliott, "The Book of Salt" by Monique Truong...OK, I'll stop now. A great list too, Chris. I read the Dana Sachs book while I was studying in Vietnam back in 99, I think. I don't know the Kim Fay book - will have to look it up. Have read about "The Lotus Eaters" but don't have it yet. 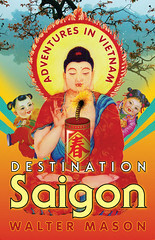 I quote "The Sacred Willow" in "Destination Saigon," and I LOVE everything by Monique Truong - I think she is a genius. I have recommended her novels to so many people, and they always report back to me and thank me for it. I preferred Dana's book to Catfish and Mandala. While the latter was interesting, I found it really negative. I should read it again though. I didn't dislike it, just had the impression Pham was a pessimist. Haven't read Dragon's Journey...looks interesting. Same goes for From a Chinese City. Karnow's book is invaluable, and your book is on my TBR list. I read your book several months ago when I was first considering taking a trip absolutely anywhere overseas. I loved your stories. My memory's a little vague on the details now, so I mostly just remember the broken chairs (you poor thing!) and some motorbike travels with a monk. (Cool!) I think you provided a very honest and real account of your experiences, and I came away feeling very warmly towards the Vietnamese people. It was a very enjoyable read. Anyway, I have now decided to travel to Vietnam and I will be going in 2 weeks. Yay! I have been looking for a list of non-fiction novels to read before I go and during my bus trips and you have provided the best-looking list yet. Thanks! Bon Voyage, Monkey! Make sure you tell me about your trip when you get back.